San Teodoro. 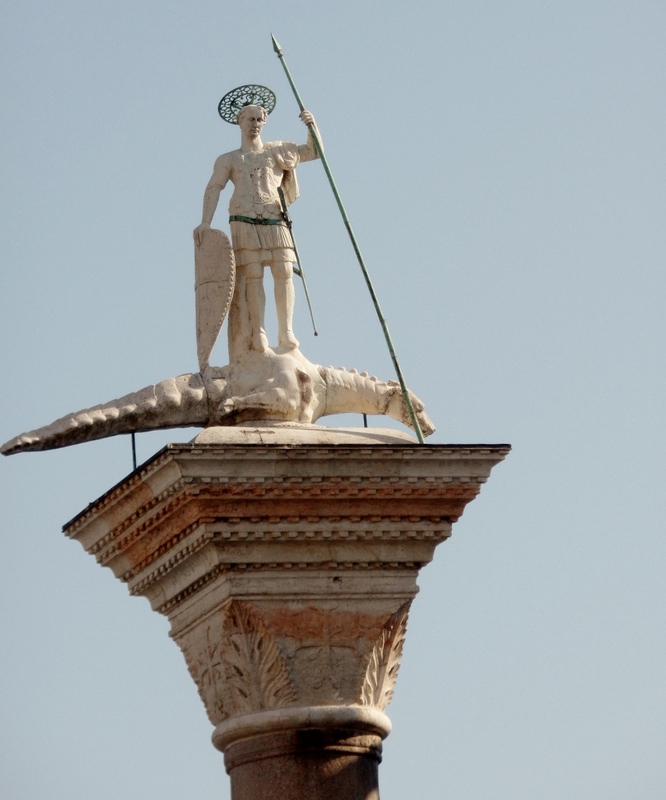 Sits atop one of two columns built near the waterfront in 1172. 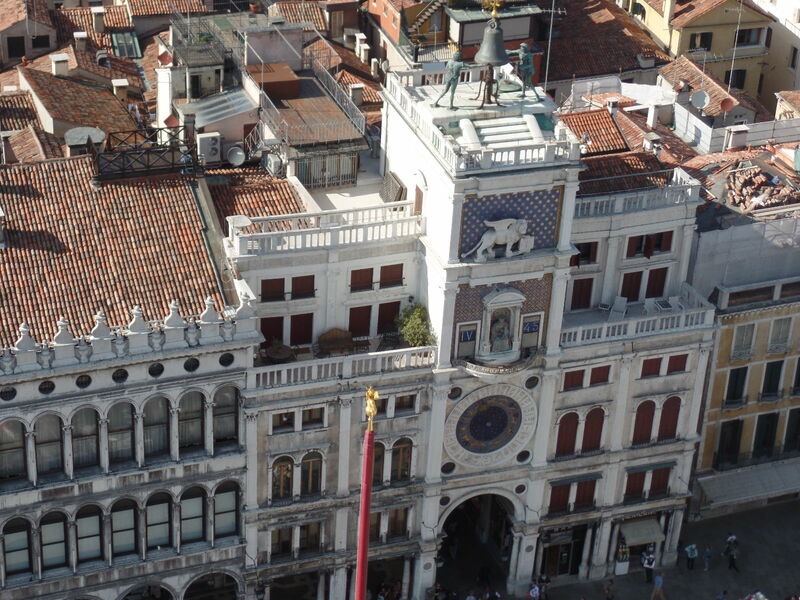 The Torre dell’Orologio, a Renaissance era clock tower built in 1499. 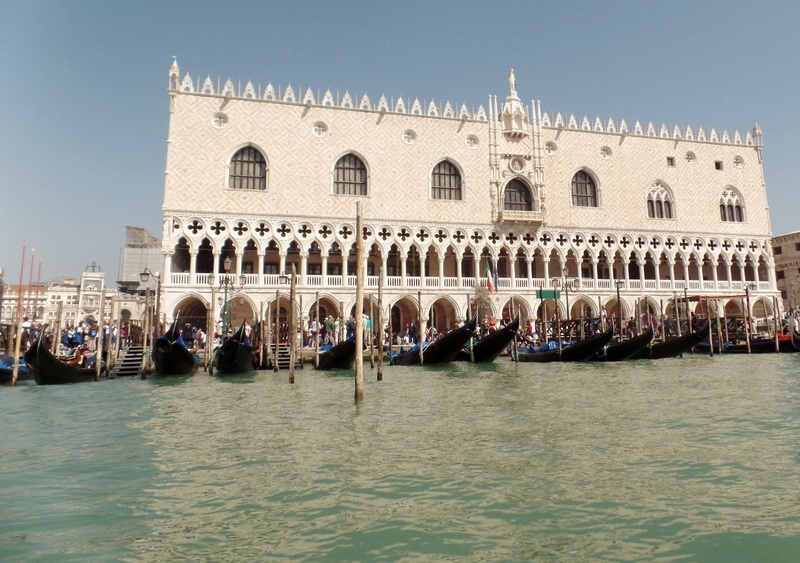 Built in 1424 the Doge’s Palace was the primary seat of government for the independent Venetian state. 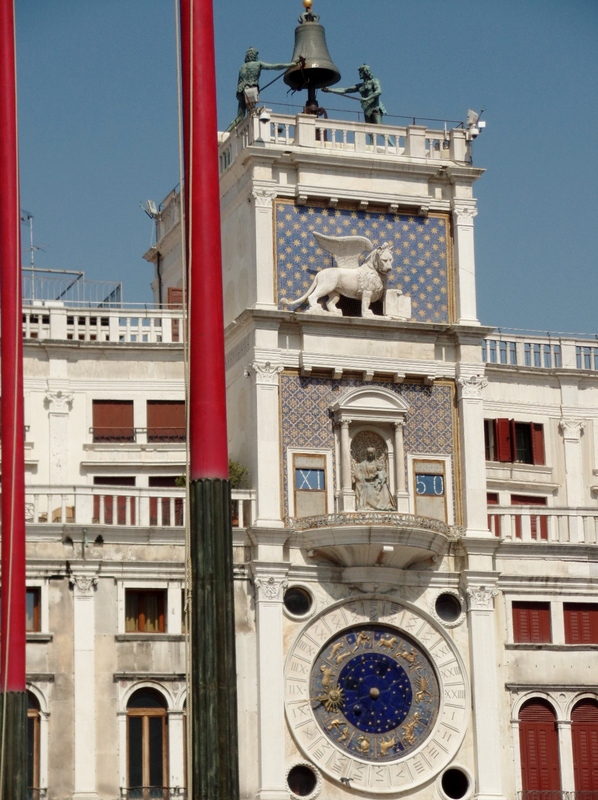 The Doge was the highest political office in the Venetian Republic. The building also the site for administration of justice and housed a prison. Connects the Doge’s Palace with the prison. It is here that prisoners got their last look at the outside world before their confinement. 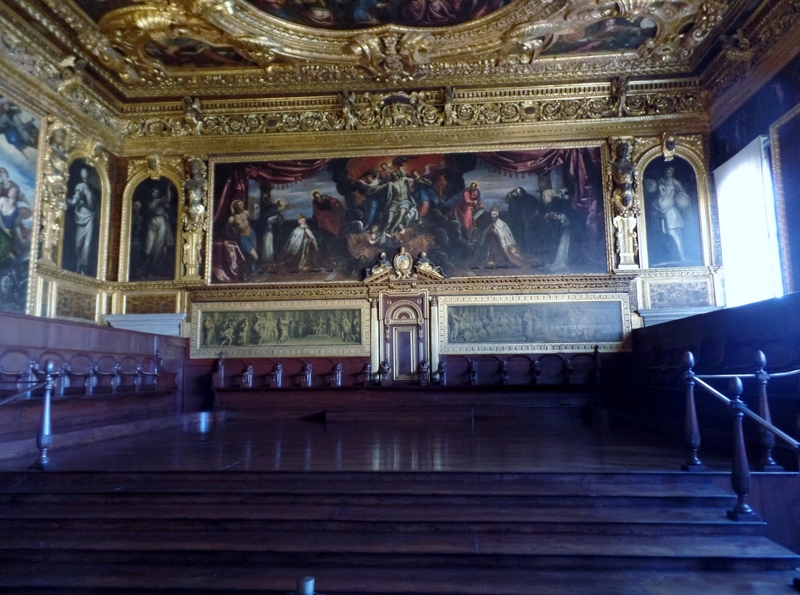 One of the council meeting rooms. 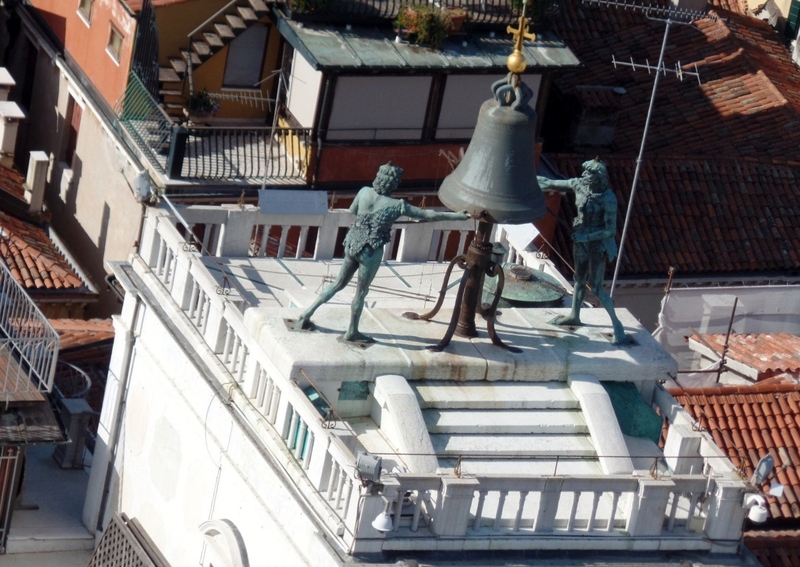 The Campanile is the bell tower of the Basilica. 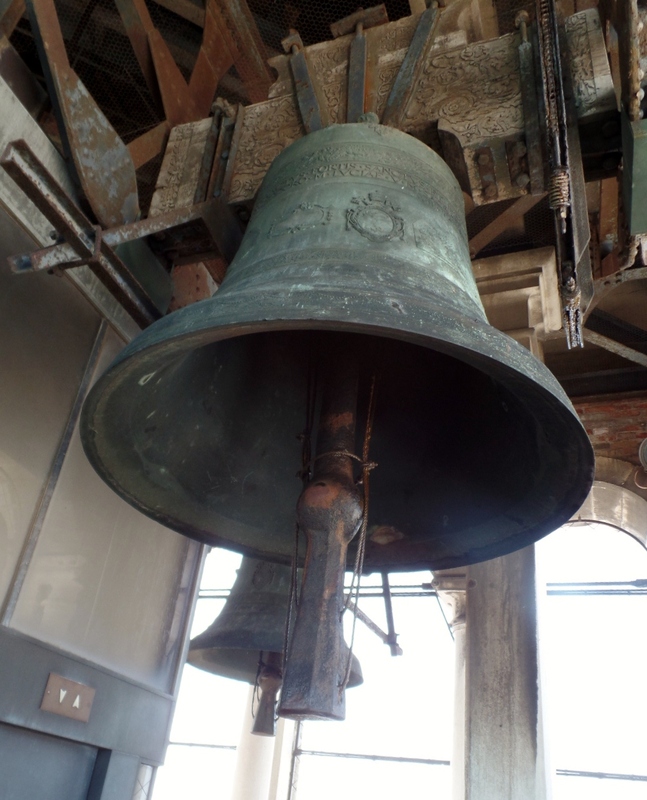 The current structure was built in 1912 after the original 1514 tower collapsed. 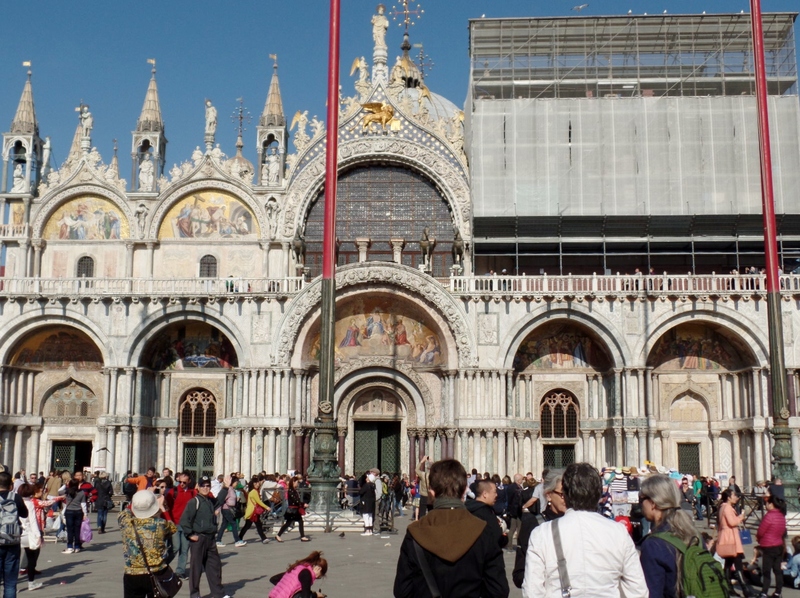 This entry was posted in Travel and tagged Basilica San Marco, bell tower, Bridge of Sighs, Campanile, clock tower, Doge's Palace, Italy, Piazza San Marco, San Marco, Torre dell'Orologio, travel, Venice. Bookmark the permalink. I love every Italian city’s Piazza! It’s been a number of years to our one trip to Venice but just this past month, we visited Tuscany for a third time. 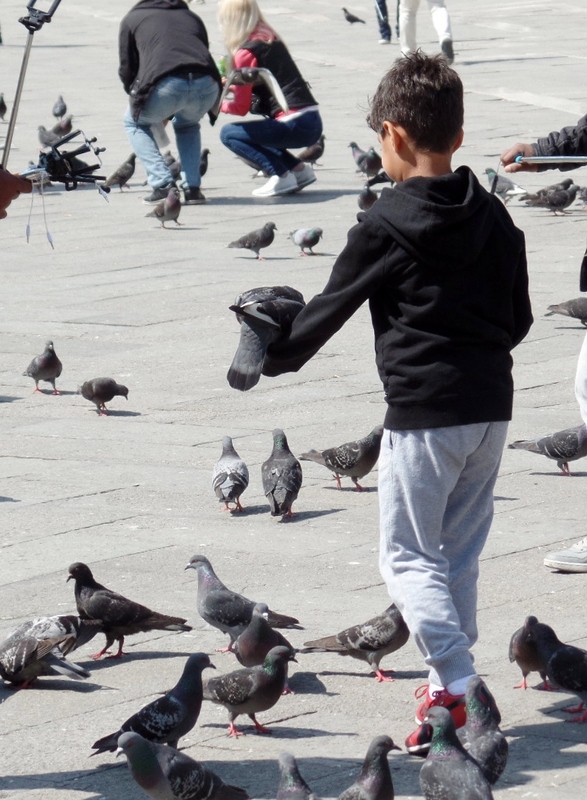 The San Marcos pigeons pics remind me of Siena’s Piazza. Ciao! Wow! These pictures are fantastic! I’ve been to Italy 4 times and still not made it to Venice! I need to correct that…and soon! 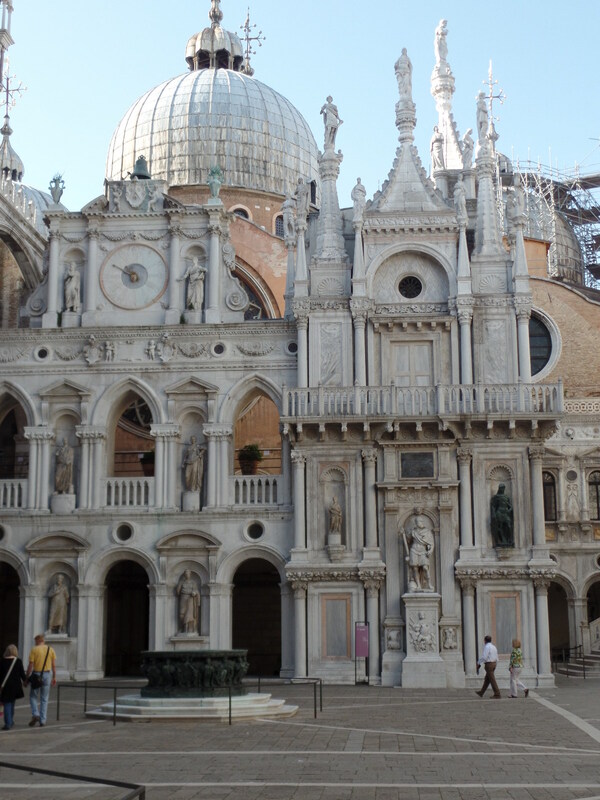 Venice is on my ‘go to list’- the architecture, the food and of course the river ride! It seems there is so much to see – where would I start? I think the best place to start is to take a boat down the grand canal through the center of Venice. I lived in Venice for a semester in college. Thanks for bringing back such happy memories! I love Venice! I like your pictures much better than mine, except that my children are in mine and I got quite a few of them chasing pigeons. It’s been many years ago and I’m itching for another trip to Venice. What great pictures of Venice! It should be on everyone’s Bucket List of places to see before they die. The history alone is just fascinating. Your images are so beautiful! Great photos. I do need to get to Venice sometime. It looks beautiful and fascinating. I like the naming of the Bridge of Sighs – so appropriate. Oh my gosh, it is like the world is screaming that I should go to Italy. My husband and I were just talking today about how we need to make the trip happen. I even have a place in Rome where I could stay for free. On a different note, if I were going to prison I would want the bridge of sighs to be the last thing I see. It seems like a wonderful image to hold onto while behind bars. Yes but you might let out a sigh or two about what you are missing. Great photos from Venice. It’s a beautiful place with a very interesting, and powerful, past. Great photographs. I love seeing photos and reading about Venice. It is one of those places where I want to visit someday. People don’t realize that Venice is built on top of a series of Islands, hence why some of the streets are water. Also, the city is being held up by wood pillars, but, the salt water has petrified the wood into a stone like structures. Thanks for sharing. It’s amazing to be in a city with no cars. Makes it feel cleaner and quieter. What lovely pictures of Venice! I was there when I was a pre-teen. My parents are from the Rome area so one summer we traveled around Italy to check out cities were didn’t have family in. The few things I remember is going to a placed that made glass blown art and my parents buying many of them. And, Venice smelling like fish. It’s amazing what you remember. Thanks for sharing. The glass blowing site is the island of Murano. I went there as well. Fantastic photo’s of my favorite city! I can’t say enough about Venice, but I think aside from its beauty the king I like best is that you go two streets away from the crush and you are in a wonderful quiet street. Thanks for this. Ken, this was a wonderful pictorial. It did make me wonder though why anyone would build a city where you would have to take a water taxi to get around. Those buildings, that are surrounded by water – what happens to their foundations? I Holland they built dams to keep the water out, but in Venice they built right in the water – amazing. There’s water taxis and water buses and ferries and there’s so many bridges you can walk just about anywhere. I didn’t miss cars and roads for a minute. It made for a cleaner and quieter city. I was there last week and there were a lot of people around. I can only imagine how jammed it must get in the summer. Venice has always been one of those cities that has captured my imagination from an early age. 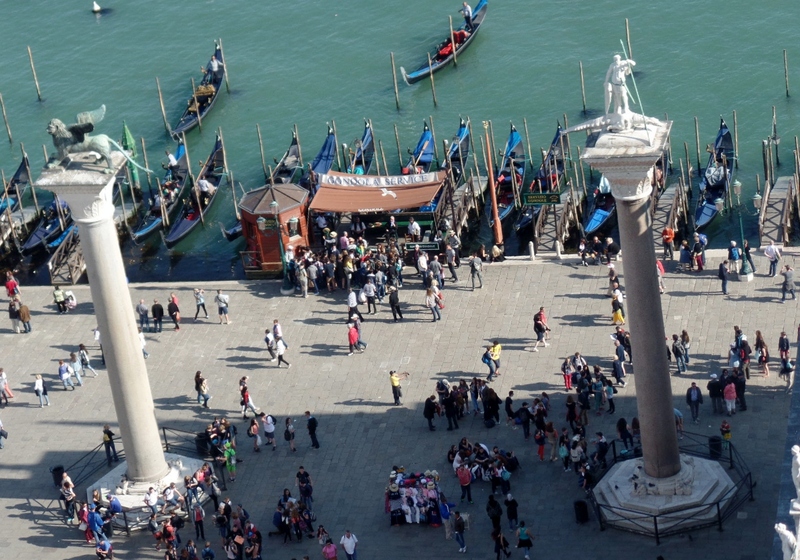 I did, a long time ago, work as a tour guide in Venice and got to know it well. 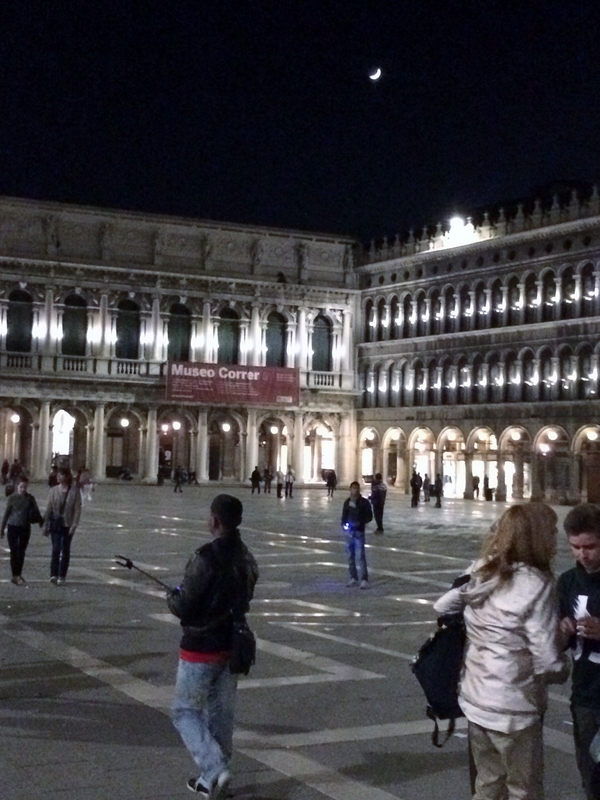 My favorite time of year is when the big tides arrive and San Marco square goes under water. Those pictures look wonderful. I would love to visit Venice one day. I own a vinyl copy of Robin Trower’s Bridge of Sighs. 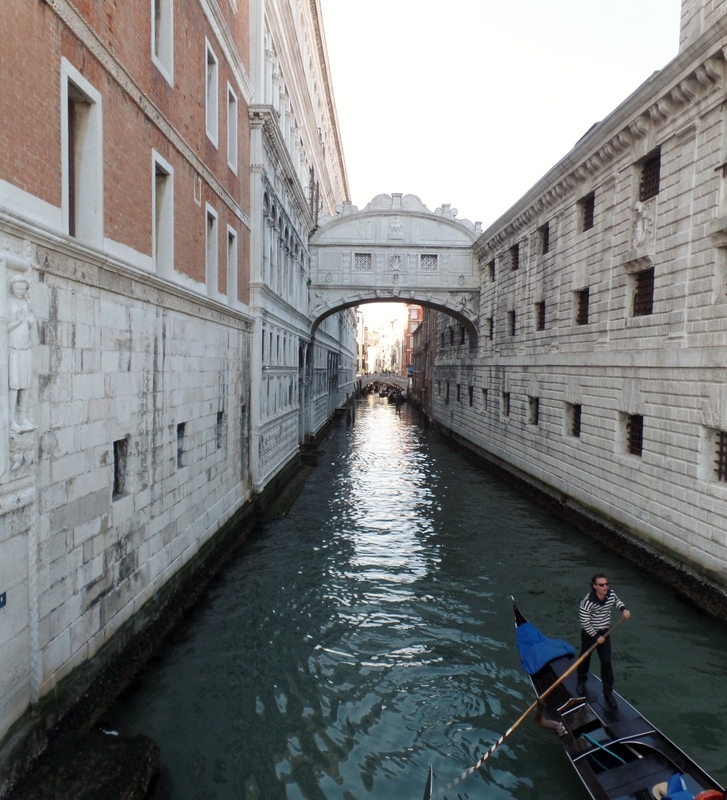 I didn’t know the Bridge of Sighs was an actual place – you learn something new every day. Great picture tour of Venice, Ken. So many places to see in Italy and so little vacation time. I’m glad you gave me a little trip there! I know Susan Cooper here, and now I know you! At first I couldn’t place your name, and then I realized why it sounded familiar. Thank you so much for following my blog!! I have so much respect for you after reading your review. When I visit here we can talk sociology. I had fun reading about and analyzing the 50’s on your review. By the way, in response to this post, I teach Medieval Europe.